Start your day off right by adding a tasty twist to your breakfast or dessert with our selection of freeze dried fruits. Ideal for adding an extra burst of sweetness to your breakfast, our fruit selection contain 100% fruit. Whether you’re looking to mix things up and create your own take on a meal, or you simply use them as a quick snack while you’re on the move, this selection of freeze-dried fruit is a versatile food to bring along with you wherever you go. This gives you a range of familiar flavours and textures to choose from when you’re on the go. Freeze-drying keeps all the nutrition locked in , meaning you don’t sacrifice on quality or taste when you buy our freeze-dried fruit. 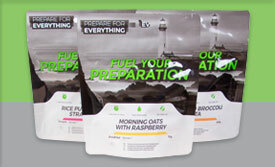 This freeze-dried fruit is perfect to eat as is, but it’s also really simple to rehydrate too. All you need to do is add water, and the fruit will be back to its usual state within minutes. 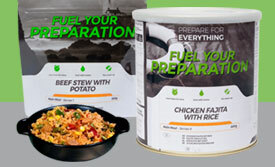 Because you can use our freeze-dried fruit in a variety of ways, it’s a perfect addition to any expedition food stock. 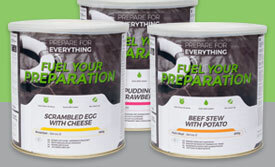 Whether it’ll be an exhausting day and you’d like to start off with a fresh, energising take on a favourite meal, or you’re pressed for time and need a quick snack mid-hike, this selection can be the perfect expedition food to bring along. BlueberryPer 100g: Energy 1439kJ / 340kcal, Fat 5.4g, Of Which Saturates 0.43g, Carbohydrate 67g, Of Which Sugars 49g, Fibre 16g, Protein 5.9g, Salt 0.07. RaspberryPer 100g: Energy 1549kJ / 366kcal, Fat 6.5g, Of Which Saturates 0.43g, Carbohydrate 70g, Of Which Sugars 39g, Fibre 14g, Protein 7g, Salt 0.15g. Strawberry Per 100g: Energy 1473kJ / 338kcal, Fat 16g, Of Which Saturates 0.0g, Carbohydrate 74g, Of Which Sugars 45g, Fibre 11g, Protein 7.5g, Salt 0.1g. © 2019 European Freeze Dry. All Rights Reserved.